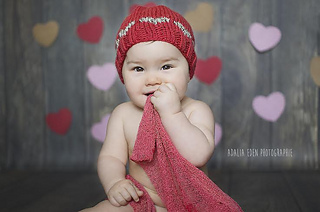 I may be a bit late for Valentine’s Day this year with this pattern, but it’s just too cute not to share anyhow! 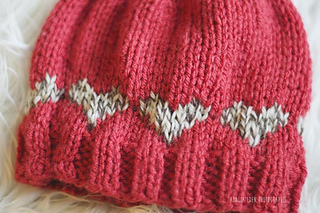 Perfect for those new to color work, you’ll only work the contrasting color for a few rows, giving you just enough practice with two strands before you start to get so frustrated you just want to quit! 50-120 yards worsted weight acrylic for MC. 20 yards worsted weight acrylic for CC. Note: Any big box craft store worsted weight acrylic will work for this hat. Some suggestions include Vanna’s Choice, Loops & Threads Impeccable, and Bernat Super Value. 12 (14, 16, 18, 20)” circumference unstretched. 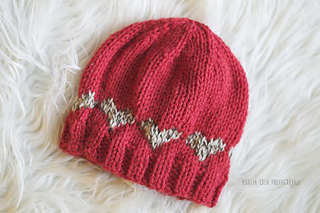 Hat will stretch up to 3” to fit a wide variety of heads.